There are 3 possible methods to unlock a T-Mobile Android phone with the Device APP installed. 2) Using a 3rd party service to unlock it using the T-Mobile APP. This method is the same as the previous method. You will use the official T-Mobile device unlock APP to unlock the phone but you won't call or pay T-Mobile. This is especially useful if T-Mobile wants to charge you more money than us or they refuse to unlock it because money is owed to them. Then you can use this service. It should be noted: If your phone is blacklisted by T-Mobile then we also have a service to remove this Blacklist from their database. Remember, if you don't remove this blacklist, then even if the phone is network unlocked, no other carrier in North America will allow it on their network. 3) Using our T-Mobile unlock APP bypass sotware: This method is usually the cheapest and FASTEST option and it works great. Basically you need to download our white labelled software. When you download the software and run it on your computer (with WINDOWS) you will need to enter in a username and password. We will provide you with this username and password once you have paid for the service. Once the software is running you would simply need to connect your phone with the USB cable that came with the phone to one of the available USB ports on your Windows Computer. After your phone has been detected, simply press the unlock button on the software and the software will do all the work the unlock your phone. Once your phone has been unlocked then you can disconnect it from the computer and use it on any compatible network worldwide. Please note: If the phone is blacklisted it won't work in North America unless you remove the blacklist (we have a service for that too!) Refer to the bottom of this page for more detailed steps on how to download, open and use the software. No Rooting, No Finger Print Required. Simple plug and play solution to unlock a T-Mobile Android phone . This is a Permanent Unlocking Solution. Back in 2014, T-Mobile changed the way certain Android smartphones could be unlocked from their network. By pre-installing a Device Unlock App on the phone, T-Mobile customers can now request and apply a mobile device unlock directly from the device. This is the only way to unlock a Samsung, LG, Alcatel, HTC, Huawei, Kyocera, Motorola, Sony Xperia or ZTE phone from the T-Mobile network with the Device Unlock App. Before proceeding to order the unlock service from us, just make sure to check that the APP is working correctly. When using the APP it should initially say "Not Eligible for Unlock", if you are getting the messages "Communication Error" or "Server not responding" Please try again later." then do not order until you find a way for your phone to communicate properly with the server. We have some tips to fix these errors that you can find at the bottom of the page. Don't install any device unlock APPs from the Google Play store! The official T-Mobile Device Unlock APP is not in the Google Play store although there is a lot of look-a-like [fake] apps to be found when searching for 'DEVICE UNLOCK APP'. The T-Mobile APP comes in the Application folder that is already pre-installed on your phone. If you can't find this APP then it may be hidden, you can try searching for it in your app settings. What if the APP is not found on my phone? If the APP is still not there, then there is two possible reasons for that. Either your phone is already unlocked [the APP uninstalls itself after a successful permanent unlock] or the second possible reason for the APP to not be there is that your phone was made before 2015 when T-Mobile was still using unlock codes. If that is the case, then you need to order an unlock code instead [Message us and we will provide a code instead]. If this is the case then before ordering an unlock code, simply insert a SIM card from a different carrier and make sure the phone asks automatically for a network unlock code. 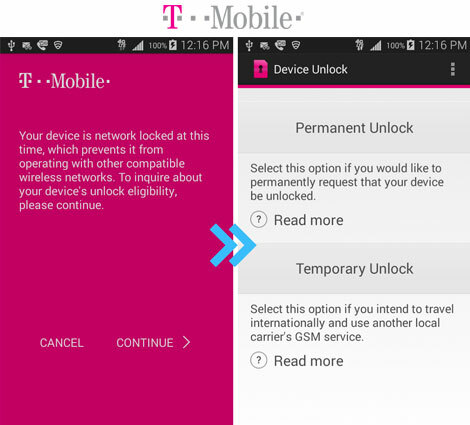 T-Mobile has eligibility requirements before you can unlock your phone using their APP. But not to worry, even if you are not eligible according to them we can still unlock your phone using THEIR APP. All you have to do is submit an order with us. At the top of this page, you will find the order form. Simple select the service from the list and Click NEXT. Once we have emailed you that your order is completed, then simply Open up the APP on your phone and make sure your phone is connected to WIFI, and then simply click on Permanent Unlock. You should get the message: "Unlock Approved: Mobile device is permanently unlocked". Now make sure to restart your phone [this is important]. That's it, now your phone needs to reboot and then it is successfully permanently unlocked! Congratulations. What if my T-Mobile phone is Blocked for unpaid Bills, will the service work? If your phone is blocked or blacklisted because it is reported lost or stolen or has unpaid bills then the phone may not work even after successfully unlocking it since carriers in North America are required to refuse service for phones reported as Blacklisted. Before unlocking any phone, please check your IMEI first. 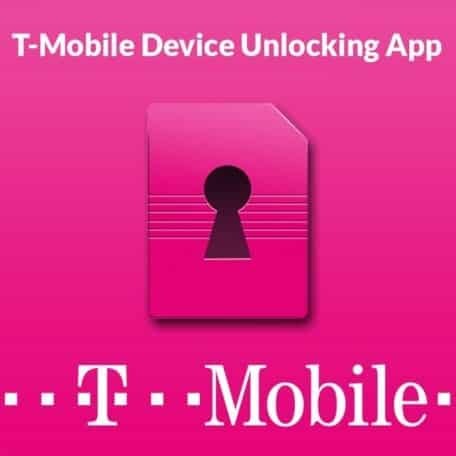 What to do If you are getting the T-Mobile Device Unlock APP message- "UNLOCK FAILED" or "Connection Error"
and then use the Device Unlock APP again, this time it will work. Once the fle has been downloaded make sure it passes your anti virus checker. Click allow if prompted by your anti-virus software. Go to the folder where you have downloaded the ZIP file called WL Client. Unzip the file using winzip, 7-Zip, PeaSip or any other free software. Once it has been unzipped, open the file called: TMO Client. Click RUN to open the program. Your T-Mobile device has been successfully unlocked. No Rooting, No Finger Print Required. Simple plug and play solution to unlock a T-Mobile Android phone . This is a Permanent Unlocking Solution. Only Some T-Mobile Samsung phones from 2015 still need unlock codes and do not have the Unlock APP installed. Before oredering the unlock APP service make sure that the phone has the APP pre-installed and does not request a sim network unlock pin.